Islington Council Pension Fund pensions sub-committee chairman. The Islington Council Pension Fund hit headlines late last year when it allocated £20m (2.5%) of its £810m fund to residential property. The fund was one of the first pension funds in the UK to allocate to residential – an area of property which is traditionally seen as higher risk than its more popular commercial counterpart. However, as Islington Councillor and chairman of the pensions sub-committee, Richard Greening explains, the decision was driven by the potential revenue and growth attached to residential, as well as reflecting the council’s aim to build more affordable housing in Islington. Elsewhere, the Islington fund – a member of the Local Government Pension Scheme (LGPS) – is invested in UK and global equities, corporate bonds, commercial property and private equity. Why did you decide to invest £20m in residential property? It has been my view for some time that residential property was an investment class we should be invested in and we had been looking for a suitable investment vehicle to do it with. The evidence is that residential property is strong in terms of both the revenue returns and capital growth. If you compare the housing market to equities over the last 10 years it is a no-brainer; the housing market did correct in 2008/9 but has shown strong growth the rest of the time. It strikes me as mad to ignore this sector but the lack of products has been a problem. As a council we are very focused on the lack of affordable housing in Islington. We are building 2,000 new homes over this fouryear term so it does make sense for our pension fund to be investing in housing. We came to the conclusion we wanted to invest between £10m-20m. The Hearthstone Fund is a UK market tracker so the risk is spread and we are convinced by their team. Why did you go for the full £20m? There is a limit on partnership investments and there was the potential of it getting too close to that, but we are comfortable we will stay within that limit and in any case the government is going to raise it from 15% to 30% soon. The £20m is 2.5% of the fund so 97.5% is not in residential property but it seems to us to be a proper balance between the risk and the potential of this new investment without over-committing to it at this stage. Were there any potential concerns before making the investment? The negatives are things like the involvement in housing management and repairs. It is also perceived to be not so liquid, but for pension funds liquidity is less of an issue because we take a long-term view. If we can’t get our money back immediately it doesn’t matter, because we are investing for 20, 30, 40 years. We also have investment in commercial property which was initiated about eight years ago, but we have moved into residential because we see that sector as a particular opportunity. How are you accessing commercial property and what is the appeal? We have three funds with Aviva Investors, Threadneedle and Franklin Templeton, which are UK and global property. At one point, commercial property was the only thing showing a positive return and it has been a useful diversifier. Will you increase the fund’s allocation to property in the future? We will be looking at the strategy when we have the next valuation. I think we should be looking to increase the investment in residential property but we want to make sure we are happy with the way this initial investment is working. Have you considered social housing as an investment opportunity? We would certainly be interested if the right vehicle comes along. It would require a certain amount of grant to help us achieve our investment objectives. The government could potentially provide a small amount of grant with a given amount of pension fund investment and make the money go further. But at the moment we need to make sure that we take this step-by-step. Is the Pensions Infrastructure Platform of interest? Yes, potentially. Also, if a vehicle was set up for the London funds that would mitigate the risk of complicated infrastructure projects we would also consider that. However, we think investment in housing is as good as anything in terms of its economic benefits and from the return perspective. An individual property is not much in terms of its overall cost and value; the risk is spread compared to a single infrastructure project. The fund has largely underperformed over the last 10 years. Why? We have had problems with the effectiveness of some of our managers. We got rid of one then replaced it with two global equity managers who proceeded to under perform. I think the appointment of managers based on past performance carries significant risk, because whether they are growth or value biased they tend to go through cycles and if you pick someone with good performance over the past 10 years that cycle is likely to change. But the managers are starting to perform better as there have been changes in approach and personnel. Also, we have probably had a bit more in equities than some other funds so that may not have helped. 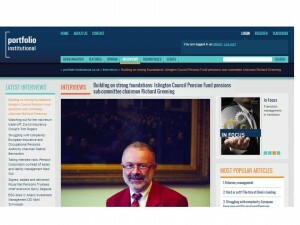 Will the Islington Council Pension Fund’s asset allocation change in the future? We may want to reduce the amount of equities over time but obviously we have to take advice on the best strategy based on the maturity of the fund and the overall mix of investments. I can see us doing more in residential property and can’t see any reason why we should not reach a point where we have 15% of the fund in that and 15% in private equity.